ECLECTIC by Tom Dixon is the first collection of extraordinary accessories, gifts and design objects inspired by British heritage and crafted from honest, resilient and heavyweight materials including copper, marble, cast iron, brass and wood. These products are made to be used or played with, to be treasured or to be given. 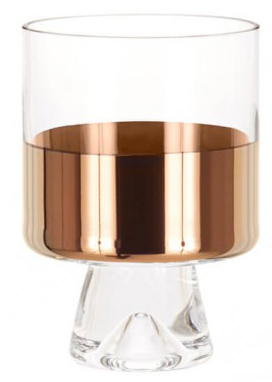 TANK low ball is made from mouth-blown clear glass ornamented with hand-painted copper detailing. A heavy and generously proportioned object with our logo sand-blasted on the base. Especially made for short drinks, perfect for whisky and cocktails. Presented in white gift-packaging. Sold in pairs. Go to A Trip To The Moon.